Welcome to Stiperstones class! We are a friendly bunch of year 1 children. Our teacher is Mrs Hopwood and our teaching assistants are Miss Storey and Mrs Kings. Happy New Year! We hope you all had a lovely and restful break. This term our topic is Achievements and Legacies. We will be focusing on people from the past who have left a legacy and achieved something significant in their life time. During the first half of the term we will be exploring the achievements of Neil Armstrong, Tim Peake and Helen Sharman and learning about space. We will be turning our role play area into a space station and hope to chart the stars across the skies! During the second half of the term we will be learning about ‘The race to space’. As always, if you have any questions please do not hesitate to come and speak to me. In English we will start by writing recounts before moving on to writing explanation texts. We will then move on to researching famous space explorers and write writing about them. We will also share stories set in imaginary places and write our own stories based on those we have heard. In Maths this term we are focusing on all four operations (addition, subtraction, multiplication, division). We will be applying our knowledge in regular problem solving sessions. 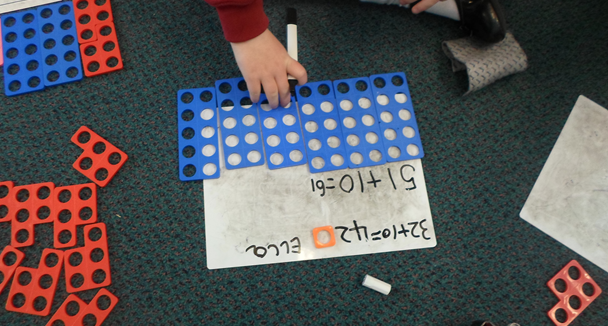 Using numicon to help us with our maths! This term in theme we will be looking at space exploration. We will start by imagining that we have been to the moon before finding out about people who have travelled to space. In the second half of the term we will be finding out about NASA and what ‘The race to space’ means. Children will read their books in school. This may be independently or with an adult. In addition to this they will have guided reading sessions. Children will be given the opportunity to change their books three times a week. All children will have a daily phonics session. This helps children to learn to read words and to spell words. Forest School is on a Friday morning (for all children) Please can your child come to school wearing suitable clothing (warm old clothing) and bring their uniform to school to change into after the session. We have P.E on a Monday and a Wednesday but it's good to keep our P.E kit in school during the week. If you child has pierced ears and can not remove the studs then please send your child with surgical tape or plasters so that the studs can be covered during PE. Children will have weekly spellings for them to practice at night. They will be tested on these on a Friday. Children will have number fact books sent home. We would be grateful if you could help them learn their number facts. All children have log in details for ‘My Maths’ and ‘TT Rock Stars’. Please come and speak to me if you are having difficulty logging in to either of the websites. At the end of the summer term we will have a phonics check. More information about this can be found here. These are some useful websites to help your child prepare for this. Please note these link to external websites and therefore the content can not be guaranteed.